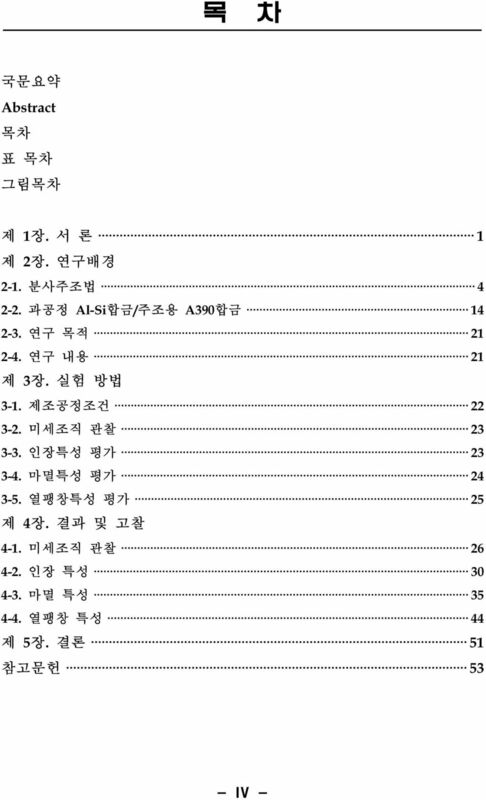 Download "분사주조한 A390합금의 특성에 미치는 Si입자의 영향"
8 Table. 1. 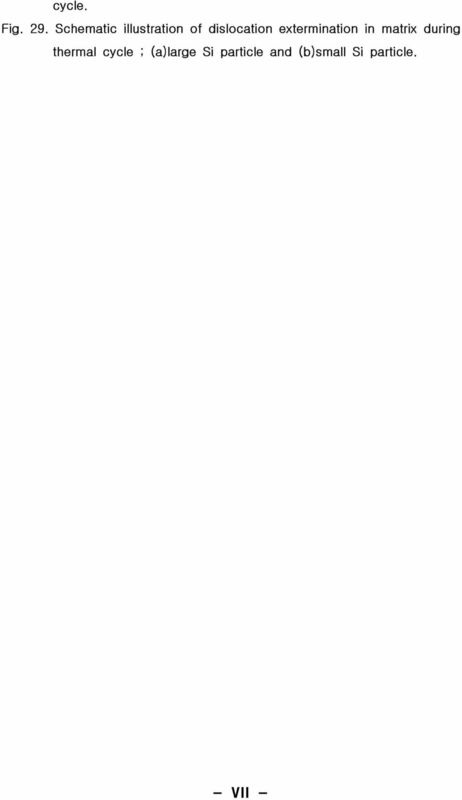 Chemical composition of 390 alloy (wt.%). Table. 2. Reactions during solidification of A390.1 alloy. Table. 3. Reactions during solidification of A390.1 alloy. Table. 4. Characteristics of phases observed by Micrography/SEM/EDX. Table. 5. 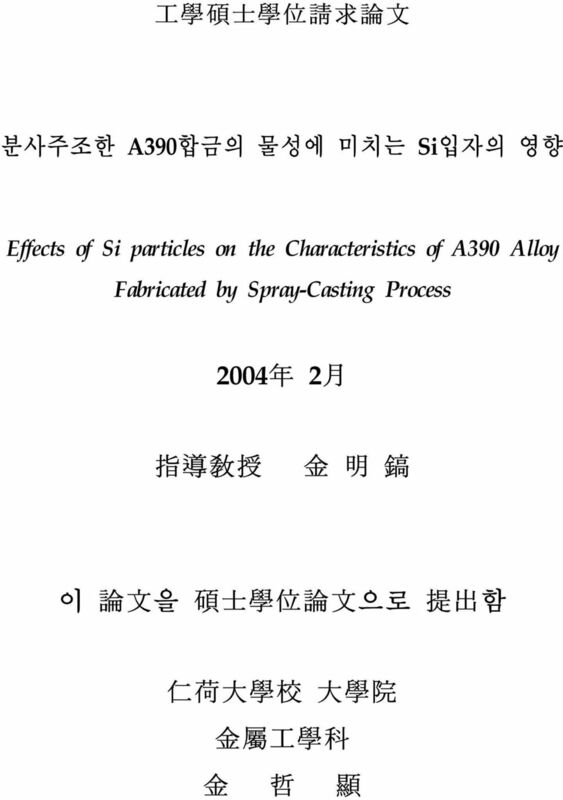 Chemical composition of Al-Si alloy(a390) used. Table. 6. Experimental conditions for each of the processes. Table. 7. Experimental condition for the hot extrusion. Table. 8. Experimental condition for tribology test. Table. 9. 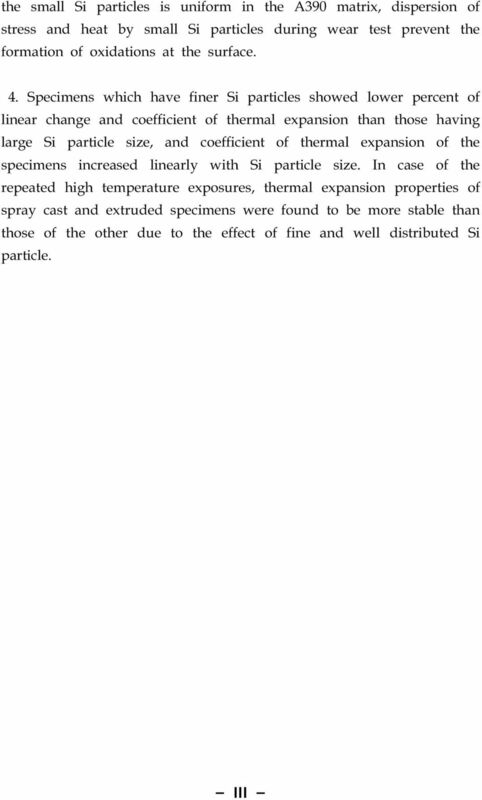 Variation of size and aspect ratio of Si particles of the cast specimens before and after hot extrusion, and U.T.S and elongation of the extruded specimens. 11 cycle. Fig. 29. Schematic illustration of dislocation extermination in matrix during thermal cycle ; (a)large Si particle and (b)small Si particle. 17 Molten metal Atomizer Orifice Gas Gas Droplet Deposit Substrate Fig. 1. Schematic representation of spray-forming process. 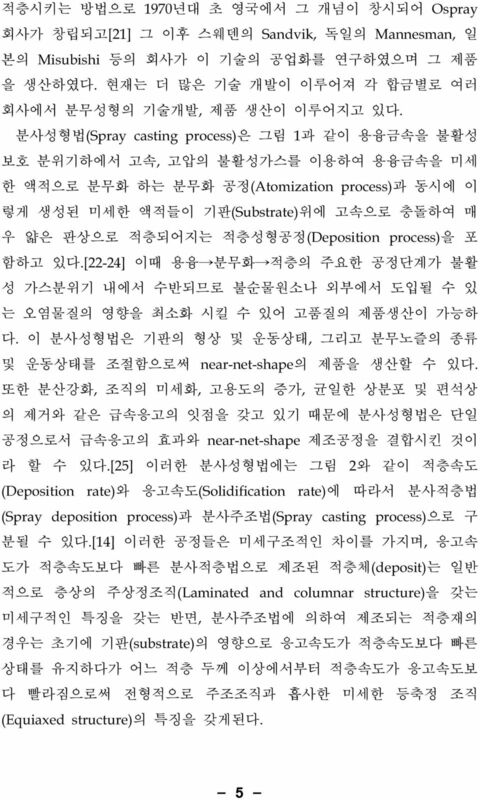 Spray Forming Process (a) Spray Deposition Process Deposit Thickness R D time solid Laminated & Columnar structure (b) Spray Casting Process Deposit Thickness R D time liquid solid Equaxed structure Fig. 2. 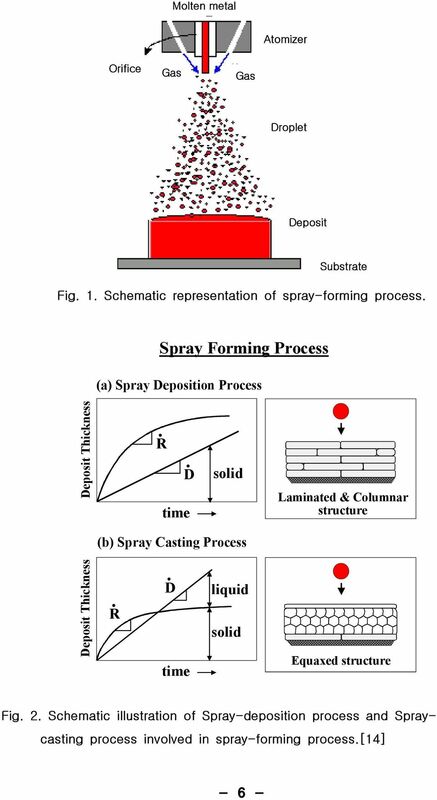 Schematic illustration of Spray-deposition process and Spraycasting process involved in spray-forming process. 20 1. Superheat 2. Flow Rate 3. 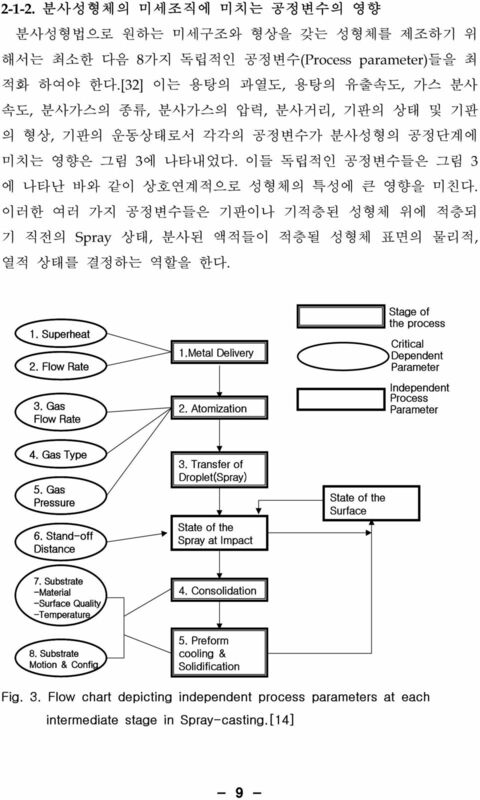 Gas Flow Rate 1.Metal Delivery 2. 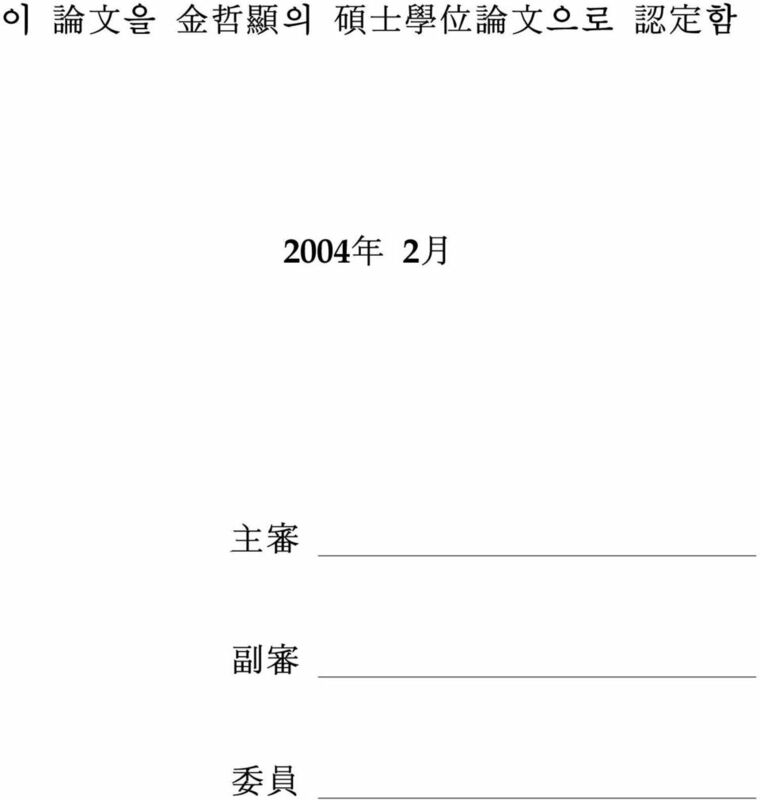 Atomization Stage of the process Critical Dependent Parameter Independent Process Parameter 4. Gas Type 5. Gas Pressure 6. Stand-off Distance 3. Transfer of Droplet(Spray) State of the Spray at Impact State of the Surface 7. 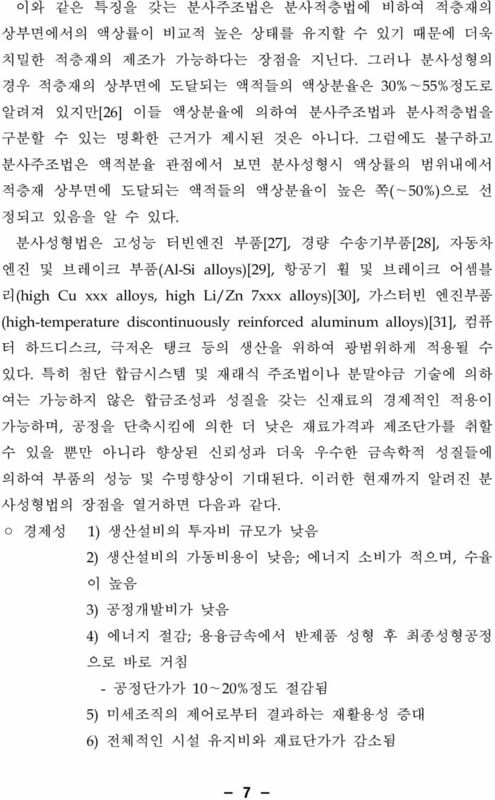 Substrate -Material -Surface Quality -Temperature 8. Substrate Motion & Config. 4. Consolidation 5. Preform cooling & Solidification Fig. 3. Flow chart depicting independent process parameters at each intermediate stage in Spray-casting. 22 Fig. 4. Interrelationship between processing, microstructure and properties. 27 Table. 1. 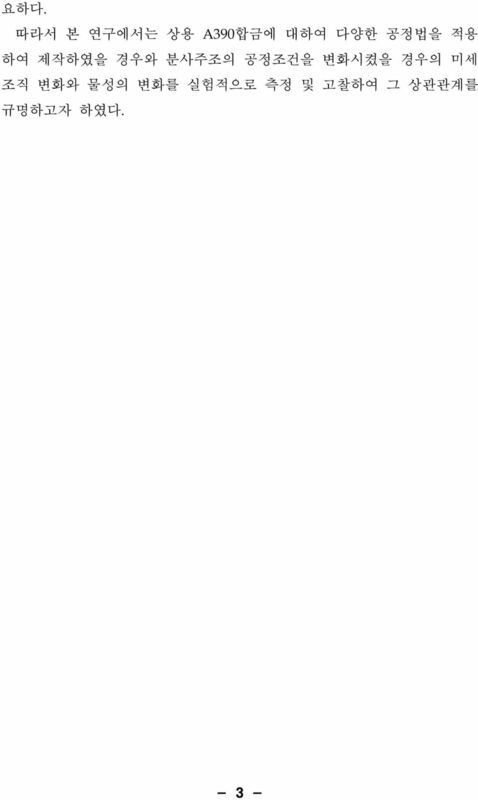 Chemical composition of 390 alloy (wt.%). Table. 2. Reactions during solidification of A390.1 alloy. 28 Table. 3. Reactions during solidification of A390.1 alloy. Table. 4. Characteristics of phases observed by Micrography/SEM/EDX. 29 Fig. 5. The tensile strength variation of unrefined and phosphorus refined Hyper-eutectic alloys. 34 Table. 6. 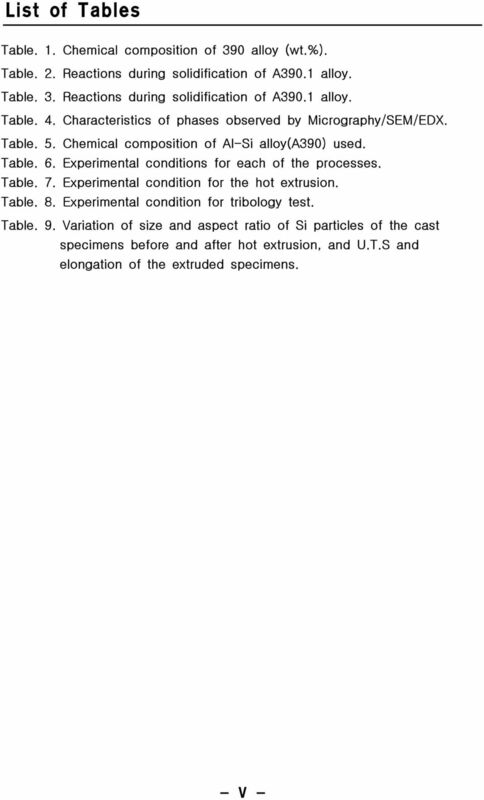 Experimental conditions for each of the processes. Table. 7. Experimental condition for the hot extrusion. 36 W = m/ρ Pl m ρ l (a) (b) Temperature /min /min PLC(%) Time 0.0 Cycle 1 Cycle 2 Cycle Temperature( ) Fig. 7. (a)schematic diagram and (b)variation of Percent Linear Change of the thermal cycle test. 38 ➀ ➁ Primary Si particle size(μm) As Fabricated 5:1 25:1 50:1 Extrusion Ratio Aspect ratio As Fabricated 5:1 25:1 50:1 Extrusion Ratio Permanent Mold Casting Squeeze Casting Spray Casting 1 Spray Casting 2 Fig. 9. Distribution of the Si particle measured by Image Analyzer before and extrusion. 42 U.T.S (MPa) UTS Elongation Elomgation (%) Average Si Paticle Size(μm) Fig. 13. Ultimate tensile strength and elongation versus average size of the primary Si particles. 45 Wear volume(mm 3 ) (a) Applied Load : 5N Sliding Velocity : 25cm/sec Permanent mold casting Squeeze casting Spray casting 1 Spray casting Sliding distance(m) Specific wear rate(mm 2 /N)x (b) Permanent Squeeze Mold casting casting Applied Load : 5N Sliding Velocity : 25cm/sec Sliding Distance: 1000m Spray Spray casting1 casting Friction Coefficient, f Specific Wear Rate Friction Coefficient Fig. 17. Wear characteristics of extruded specimens at the applied loads of 5N ; (a)wear volume and (b)specific wear rate and Friction coefficient. 46 3 (a) (b) 3 Applied Load : 5N Sliding Velocity : 25cm/sec Sliding Distance: 1000m Applied Load : 10N Sliding Velocity : 25cm/sec Sliding Distance: 1000m Wear volume(mm 3 ) Applied Load : 15N Sliding Velocity : 25cm/sec Sliding Distance: 1000m Spray Casting2 Spray Casting1 Squeeze casting Permanent Mold casting Average Si Paticle Size(μm) Fig. 18. Variation of wear volume versus (a)each of the process and (b)average Si particle size at the applied load 5,10,15N and sliding distance of 1,000m. 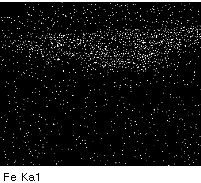 50 (a) Al Ka1 Si Ka1 Fe Ka1 O Ka1 (b) Intensity Fig. 22. 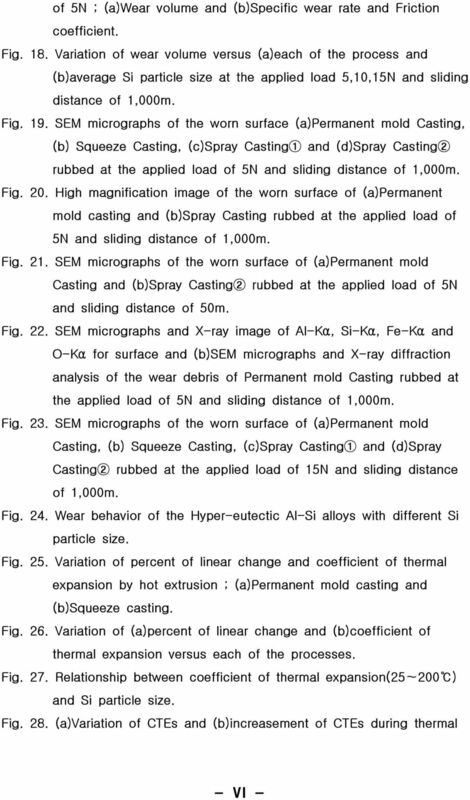 SEM micrographs and X-ray image of Al-Kα, Si-Kα, Fe-Kα and O-Kα for surface and (b)sem micrographs and X-ray diffraction analysis of the wear debris of Permanent mold Casting rubbed at the applied load of 5N and sliding distance of 1,000m. 51 Sliding direction (a) (b) (c) (d) Fig. 23. 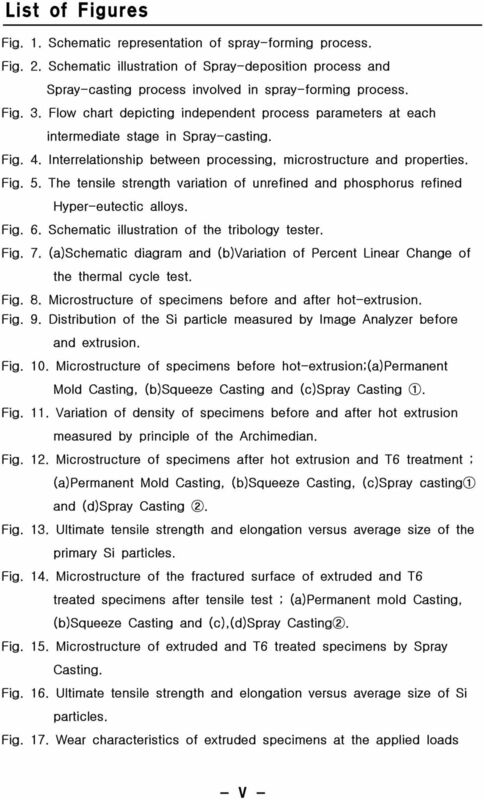 SEM micrographs of the worn surface of (a)permanent mold Casting, (b)squeeze Casting, (c)spray Casting① and (d)spray Casting ② rubbed at the applied load of 15N and sliding distance of 1,000m. 그림 23에 15N의 하중과 활주거리 1,000m일 경우 시편의 마모면을 나 타낸 결과이다. 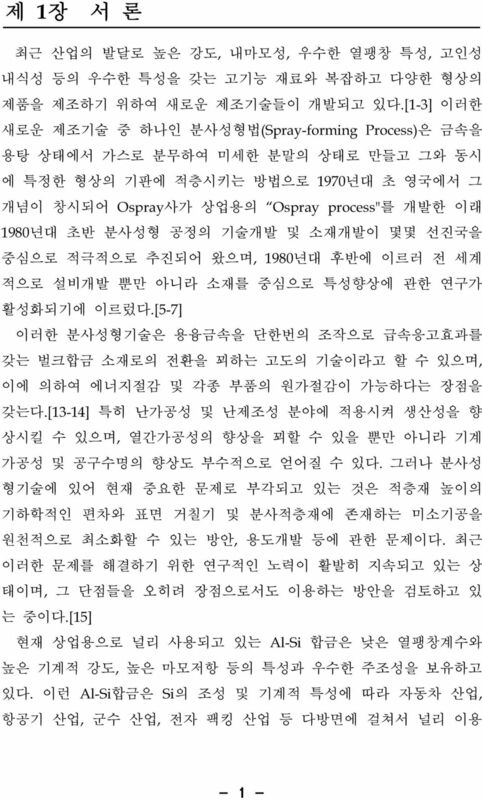 하중의 증가에도 불구하고 모든 시편에서 하중 5N일 경 우와 유사한 마모면의 형상을 나타냄을 알 수 있다. 그림 24는 이상의 결과를 종합하여 활주거리와 하중의 증가에 따른 마 모기구의 변화를 나타낸 모식도이다. 과공정 Al-Si 합금에서 Si입자가 미 세할수록 기지 전체에 고르게 분포하기 때문에 조대한 초정 Si입자가 분 포하고 있는 경우에 비하여 마모시험 시 발생하는 응력을 효과적으로 분 산 시킬 뿐 아니라 발생 열에 대하여서도 기지조직 전체로의 효과적인 분산효과를 갖는 것으로 여겨진다. 52 Matrix Si particle Matrix Si particle Small Si particle size Large Si particle size - Sliding distance - Applied load Fig. 24. 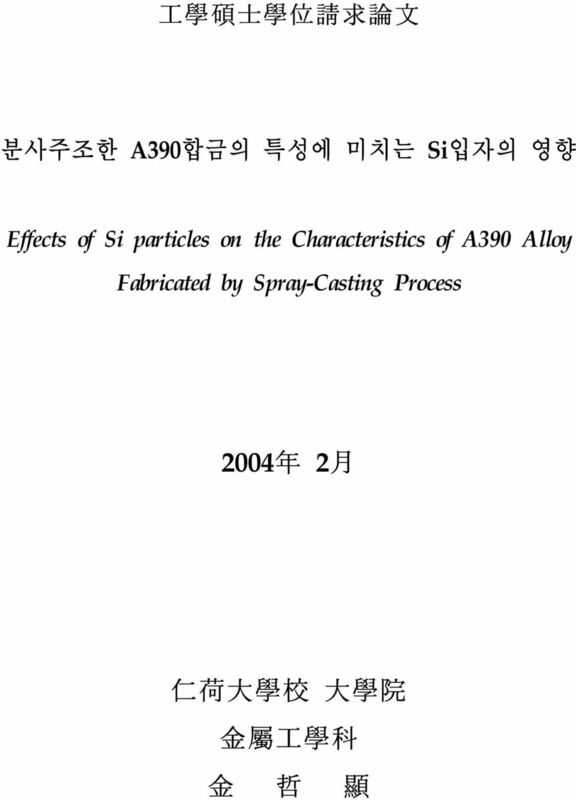 Wear behavior of the Hyper-eutectic Al-Si alloys with different Si particle size. 54 (a) (b) PLC(%) PLC(%) CTEs(x10-6μm /μm ) Temperature( ) (a) CTEs(x10-6μm /μm ) Temperature( ) (b) As cast Extrusion Fig. 25. Variation of percent of linear change and coefficient of thermal expansion by hot extrusion ; (a)permanent mold casting and (b)squeeze casting. 55 PLC(%) (a) CTEs(x10-6μm /μm ) (b) Temperature( ) Permanent Mold Casting + Hot Extrusion Permanent Mold Casting + Hot Extrusion Squeeze Casting + Hot Extrusion Squeeze Casting + Hot Extrusion Spray Casting 1 + Hot Extrusion Spray Casting 1 + Hot Extrusion Spray Casting 2 + Hot Extrusion Spray Casting 2 + Hot Extrusion Fig. 26. Variation of (a)percent of linear change and (b)coefficient of thermal expansion versus each of the processes CTEs(x10-6 μm/μm ) Average Si Paticle Size(μm) Fig. 27. Relationship between coefficient of thermal expansion(25~200 ) and Si particle size. 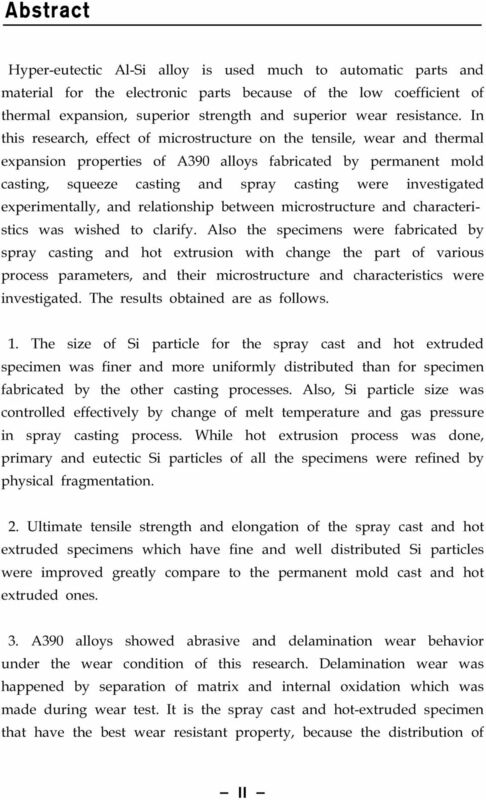 57 28 (a) (b) CTEs(x10-6 μm/μm ) ΔCTEs(x10-6 μm/μm ) Cycle 1 Cycle 2 Cycle Cycle2-Cycle1 Cycle3-Cycle2 Permanent Mold Casting + Hot Extrusion Spray Casting 2 + Hot Extrusion Permanent Mold Casting + Hot Extrusion Spray Casting 2 + Hot Extrusion Fig. 28. (a)variation of CTEs and (b)increasement of CTEs during thermal cycle. 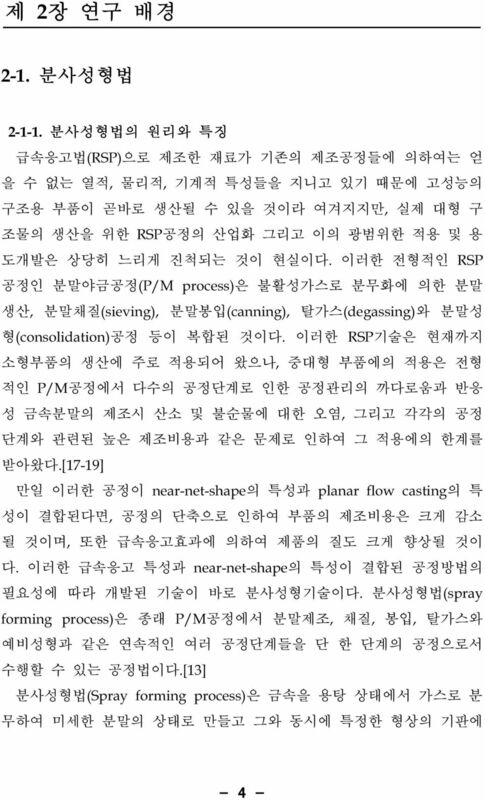 58 c b a 제조온도 상온 a : Elastic Particle zone (Si) b : Elastoplastic zone C : Elastic Matrix zone Cycle 1 Cycle 2 Cycle 3 Fig. 29. Schematic illustration of dislocation extermination in matrix during thermal cycle ; (a)large Si particle and (b)small Si particle.